from the BBC or this one from Committee to Protect Bloggers. Blogger was not compromised. 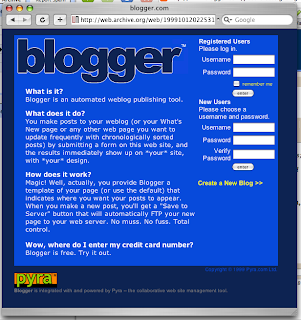 Instead, the blog posts are from bloggers whose machines were compromised by a Trojan horse. These bloggers had their mail2blogger email addresses in their computers' address books (a perfectly legitimate use case), so when the malicious software spammed every address in their address book with its content, a copy of that email was posted to their blog. We are in the process of notifying impacted bloggers and recommending that they scan their computers and run current anti-virus software, available in the Google Pack. This is also good advice for all computer users, especially those who may have clicked the links in the emails sent by the virus. For more information about computer security, check out upenn.edu and us-cert.gov. You may have seen stories in the news recently about malware on Blogger, such has this one from the BBC or this one from Committee to Protect Bloggers. Blogger was not compromised. Instead, the blog posts are from bloggers whose machines were compromised by a Trojan horse. These bloggers had their mail2blogger email addresses in their computers' address books (a perfectly legitimate use case), so when the malicious software spammed every address in their address book with its content, a copy of that email was posted to their blog. Today we are releasing video uploading to Blogger! This feature allows you to upload videos and create a video podcast with the same ease that we currently provide with photo uploading. To learn more about video uploading and see an instructional video on how to create a video podcast, go here. Thanks to everyone who has supported us over the past four-fifths of a decade, and thanks especially to you for all the blogs. In honor of our birthday, we have a small present in the form of an iGoogle gadget for Blogs of Note. Click the “Add to Google” button below to put the day’s Blog of Note on your iGoogle homepage. Today marks Blogger’s eighth birthday! A time for reflection, a time to catch our breath from yesterday morning, and a time to break out the baby picture.